Yesterday my little boy turned two. Two Years. That is how long my baby has been in my life. Feels like a moment, yet the time before we knew him seems to be as if it were another lifetime. How someone who makes the world so rich, so meaningful, so warm and wonderful could have simply not existed two years ago boggles the mind. 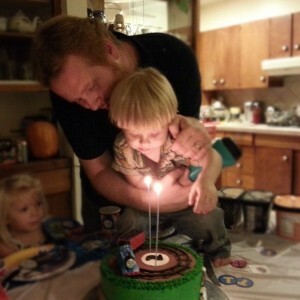 Two years ago he was just a tiny mewing infant, small enough to be held in one arm, yet fragile enough never to do so. He spent his days mostly eating and sleeping and eating and sleeping. The boy we know now is so different. He roams through the wide world with eyes wide open, taking in and investigating every possible adventure or fascination. Things we take for granted, or don’t have the interest in studying, Leif brings to our attention with wild amazement, reminding us daily that the world is truly a place full of wonders. He is patient enough to give his attention to one project at a time for long stretches. He is curious enough to repeat everything he hears with remarkable precision, putting together sentences that seem far too complex for such a young mind. He observes how others play and have fun, and is quick to join in with his own version, never doubting the activity to be any less than thrilling. It’s hard to believe it has been two years since my homebirth. My Perfect Birth. I remember so vividly the first time I laid eyes on this beautiful child, and I will never forget the peaceful and powerful way he graced us with his grand entrance. The grace and peace that I was given that day will be a lesson I will never forget. I am so lucky that despite all our struggles, he still craves his mommy’s breast and that I get the privilege of staring into his beautiful eyes as he fills his tummy with sweet milk. Yet often as I watch him lying in bed sleeping, I get a strong sense that he is rapidly growing from a baby into a boy. My heart is overwhelmed with pride and sadness. But with each tear that is shed in mourning over the loss of his babyhood, my heart is doubly filled with elation over the person he is becoming. It is a privilege to watch him grow, to bear witness to his life and development, but the greatest honor is that I am blessed to nurture him through it. Last week, I was embaressingly clumsy and took a pretty bad dive as I tripped over a toy in our playroom. Both boys saw it, and as I lay on the ground in pain I watched them rush over to me in fear. Leif reached my head first and I saw the fear in his eyes as he yelled “Mommy!” and looked down at me, tears welling in the eyes and heavy breaths waiting to be released. I was fine, but it was so humbling to experience for a moment the depth of his love for me. How I ever deserved such love I have no clue. But I am thankful, and pray that I will be a good mother to him throughout the years to come. So here’s to many more happy years! However fast they come, I promise to relish every moment, always thankful that I am your mother.